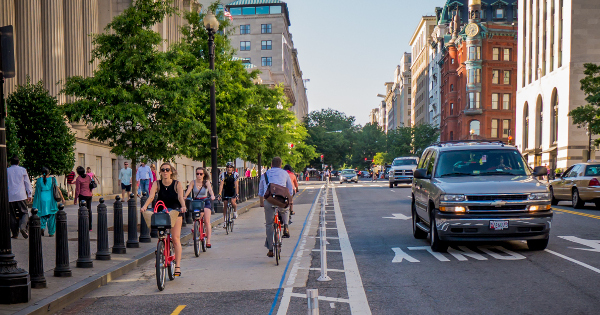 This guide shares the terminology used by the team at PlacesForBikes to talk about our work on building better bike lanes. This document captures our thinking, informed by market research, conversations with leaders in the field and our own experience. The evolution of language is one indicator of the rapid and exciting progress in this field. We anticipate updating this style guide periodically as the practice, and the way we talk about it, evolves. This is a broad term useful in discussing the work of PlacesForBikes. It includes the many flavors of bike lanes that are better than conventional bike lanes. This includes modern bike lanes that use green color, buffered bike lanes and protected bike lanes. The Green Lane Project, our previous campaign, was sharply focused on the best bike lanes for big, busy streets, which are protected bike lanes. Therefore, we suggest standardizing our language when we talk about the best kind of on-street bike lane: the kind that's physically protected from auto traffic and separated from sidewalks. PlacesForBikes' official style is to refer to these as "protected bike lanes." Emotionally resonant: "Protected bike lane" conveys to people, whether in cars or on bikes, the reassuring feeling of safety these lanes offer. Technically precise: "Protected bike lane" also conveys the other two key characteristics of these lanes—they’re just for bikes and they're part of the roadway. Easily modified: One type of protected bike lane is a parking-protected bike lane. Another type is a bollard-protected bike lane. A third is a curb-protected bike lane. Popular: Among English-language news mentions over a 30-day period in 2013, the phrase "protected bike lane" was 3.5 times more common than "separated bike lane" (212 mentions vs. 64). "Green lane" hasn't been embraced as a way to refer to these, presumably because it's too easy to confuse with painted lanes. Non-alienating: In GLP-funded focus group research, the word "separated" carried an unwelcome connotation, while "protected" was neutral. "Physical separation" can be useful as a descriptor of one characteristic of a protected bike lane. Embraced by peers: "Protected" is the standard style at Streetsblog, the leading national news source on urban transportation. Various other sites have followed. The term "cycle track" is common in technical circles, and is currently used by the National Association of City Transportation Officials (NACTO) and the Federal Highway Administration. It evolved from a literal translation of the Dutch “fietspad,” and is used in various ways in different countries, including off-street paths and striped bike lanes. However, market research indicates its meaning is unclear to laypeople. It also carries unhelpful connotations of racing, speed and the implied need for specialty equipment in order to use it. Cycle tracks and protected lanes are the same thing, which we can point out to more technical audiences. Another term, “protected bikeway,” is also sometimes used by NACTO and others. This term encompasses the larger family of protected bike facilities, such as multi-use paths, so is not our preferred term. Multi-use or shared paths; space must be designed and designated exclusively for bicycles. Buffered bike lanes; there must be some type of vertical object delineating the space at least once per block. Conventional bike lanes that are painted green. Multi-use paths, buffered lanes and bike boulevards are essential parts of comprehensive low-stress networks, and our sharp focus on protected bike lanes is not meant to dismiss their value. Rather, it’s to introduce and institutionalize an important facility type for big, busy streets that has, until recently, been missing from the vocabulary of U.S. practice. We are aware that some sectors of the technical design and engineer world have concerns about using the term “protected” in official standards and guidance, as it may raise expectations of impenetrability and safety beyond what the facilities provide. Given the breadth of the PlacesForBikes audience and our desire for simple and compelling communication, we will continue to use the term protected, noting the other terms in use as needed given specific technical and professional audiences. We use this term to describe bike lanes that have more space than a stripe between bikes and cars, but no vertical separation element. We use this term to describe standard U.S. bike lanes, which consist of only a painted stripe on the road. It’s been the standard “one-size-fits-all” approach for nearly 50 years in the U.S., and it’s been largely unsuccessful in making trips on big, busy streets comfortable for the majority of the population. Conventional bike lanes have a place in our networks, but only in limited situations. Our goal is to distinguish them from newer, better kinds of bike lanes. We prefer the term “conventional,” as it has a slightly negative connotation, over “traditional.” The NACTO guide uses “conventional” to describe these lanes. We usually use “low-stress networks” as a way to describe the biking networks that serve people all ages and abilities. Other terms currently in use are "high-comfort networks," "8-80 networks" and "AAA networks," the last one referring to "all ages and abilities." We continue to monitor and participate in the evolving conversation around the language of networks. Major components of these networks are protected bike lanes, the low-speed and low-traffic facilities called bicycle boulevards, neighborhood greenways, or 30 km zones in much of Europe, and multi-use pathways. These networks may include bike boxes, bike-specific traffic signals, left turn queue boxes, traffic calming and innovative intersections to provide a continuous high-quality, comfortable experience for anyone riding a bike.